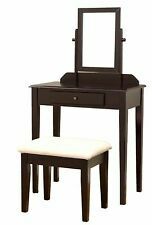 This HOMCOM Dressing table is a great addition to any bedroom, comes complete with 3 piece mirror and a stool. It has 1 drawer in the table to provide you enough room to place items. 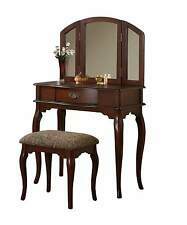 Every piece in this wooden dressing table set is finished in elegance. 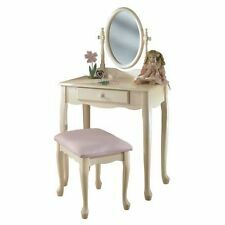 HomCom Classic Style Vanity Set Wood Dressing Table w/ Stool Makeup Mirror 2 Drawers. 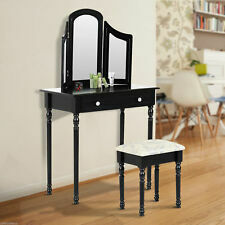 This eye-catching dressing table set can add an elegant touch of character to room decoration. 4 Piece ANTIQUE Table, Desk, Mirror, Glass Top and Newly Upholstered CHAIR! 【Practical Use】- Help to makeup or dressing. 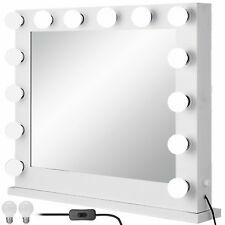 If so, you cannot miss our lighted vanity mirror. It will light up your face, not form a shadow, clear mirror imaging and provide easier makeup experience. If so, you cannot miss our lighted vanity mirror. It will light up your face, not form a shadow, clear mirror imaging and provide easier makeup experience. 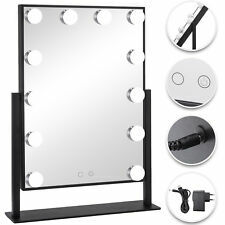 31.5X25.6" Lighted Makeup Vanity Mirror W/ Dimmable LED Bulbs CE Test. A vanity set or standalone makeup vanity adds functionality to your bedroom or dressing area, creating a designated space to choose accessories, do your hair, or put on makeup. 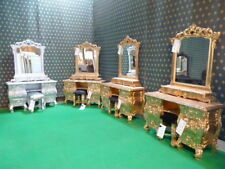 Typically, a vanity set comes with a vanity table, a stool or bench, and a mirror, or more than one mirror for increased visibility. Use these tips to match your vanity table and stool to your decor and practical requirements. How does someone choose a vanity set? Vanities come in an exciting variety of colours, sizes, and designs, so it can be overwhelming to choose just one. Use these steps to narrow down the vanity set options and find the one thats right for your bedroom. Measure available space: Choose a spot in your bedroom or bathroom, and measure the space. The dressing table and stool should fit easily in this area without blocking your way or causing you to bump into other furniture, and the mirror shouldnt block any windows, though youll want it near a window. Choose a shape: A rectangular vanity set offers ample space for makeup, while a kidney-shaped vanity enables you to get closer to the mirror. An oval vanity set lend a feminine feeling, while round or square vanities make a bold design statement. Select a style: Select the design that complements your existing furniture and personal preferences. Options include Mission, Queen Anne, modern, contemporary, traditional, and more. Pick a colour: White, black, wood finish, and bright colours are all available finishes. Choose a material: Solid wood, lightweight MDF, metal, wicker, iron, laminate, and many more can be found. Identify additional features: Drawers for makeup storage, a mirror for three or more angles, an oversized stool, and more. What materials are bedroom vanities made from? Makeup vanities are constructed from a wide range of materials so that they suit different styles and budgets. Common materials include solid wood, wood veneers, MDF, or chipboard. The included makeup mirrors are constructed from glass with a reflective coating. What is an arts and crafts/mission-style vanity set? The Arts and Crafts/Mission design aesthetic uses panels, often to showcase the natural wood grain. Like other furniture in this category, Mission vanities may feature clean vertical or horizontal lines in drawer fronts, dressing table sides, and mirror frames. This type of vanity set may be designed to look handcrafted. What is a contemporary makeup vanity style? A contemporary makeup vanity favours clean lines and simple shapes. The table, vanity, and bench may all have extreme right angles and crisp corners. Most modern vanity sets do not feature excessive embellishments or decorations and instead have a minimalist feel. What is a Queen Anne-style vanity? Queen Anne style is characterized by curving edges, carved embellishments around the mirror frame, and scalloped table aprons. These vanities often feature flattened oval pad feet and cabriole legs, where the upper section curves outward and the lower section curves inward. 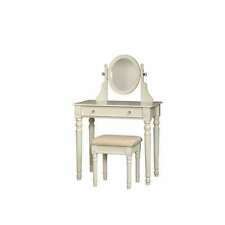 In a Queen Anne vanity set, the bench or stool is frequently cushioned and upholstered. What are some shapes of vanity tables? Vanities come in a variety of shapes and sizes. Rectangle: Wider than it is long. Oval: Rounded and slightly elongated for a feminine look. Square: Equal width and length. Kidney: Rounded sides with an indentation in the middle to place the user closer to the mirror.